One level fabulous home perfect for a family vacation. Living room includes TV, surround sound, 5 CD/DVD player, DVD library, board games & children books to enjoy. Also, a gas fireplace with comfortable leather sofas to relax on. The open floor plan has the view overlooking Sunset Lake. Floating dock is provided plus two 17 foot aluminum canoes, two paddleboards, and two kayaks. There are 8 life jackets on site. Outdoor dining, gas BBQ and fire pit for s'mores. Formal dining area, One large bathroom which contains the two bench sauna plus a regular shower and bathroom facilities. Master bedroom has a King bed and bunk bed set with a large bathroom off the master bedroom. Another full bath has hallway access. Bedrooms 2 & 3 each have queen beds and bedroom 4 has a pair of bunk beds which sleeps 4. Cable TV in all 4 bedrooms, plus free wireless internet access. Fun activities to do on site: The double garage is a game room with a ping pong table, Foosball table, and Bowflex home gym. Also, there is a full size pool table in the inside of the house with an amazing view of the lake. New to the home is a 7 foot Pedal Boat that seats 5 people and has two fishing rod holders which is perfect for Bass fishing. Also, we now have a 12 foot aluminum fishing boat with a trolling motor and a deep cycle battery. Also we provide a clam gun & shovel for those interested in going clamming. You will need to buy the proper license for this activity. Outdoor Activities in Astoria: Within a 20 mile radius, one can see dozens of exciting attractions including Fort Stevens State Park, Fort Astoria, Heritage Center Museum, Flavel House Museum, Uppertown Fire Fighters Museum, Astoria Column, and the Columbia River Maritime Museum, home to one of the nation's finest displays of model ships and nautical artifacts. For the kids, there's nothing like a trip to the Uppertown Firefighters Museum at 30th and Marine Drive. It is full of fire fighting memorabilia from 1877 to 1963. The collection includes motorized, hand-pulled and horse-drawn fire engines, as well as a large photographic collection of some of Astoria's spectacular fires. The Astoria Children's Museum is located on the second floor, and offers interactive and educational play experiences for children. Outdoor Activities in Seaside : Discover Seaside's secrets on foot - or travel through downtown's colorful streets. You'll find dozens of delightful mini-malls, specialty boutiques, antique shops, art galleries, museums, arcades and cinemas. Ride an elegant steed on the Town Center Carousel and don't forget to visit the famous Seaside Aquarium, where playful seals and spectacular sea life are the highlight of any trip. Seaside is home of a variety of marathons, Seaside is also perfect for swimming, surfing, kite flying, volleyball, golf and tennis. Steelhead, trout, salmon and other game fish are just waiting to challenge anglers. And Seaside's 12 Avenue bridge is a crabber's delight!. I graduated from Gonzaga University with a business degree. Go ZAGS!! My wife and I love to experience different foods and cultures by traveling domestically & internationally. My wife and I got married in 1993 and we decided to buy our dream home somewhere on the Oregon Coast. We traveled from north to south, Astoria to Brookings, exploring the Oregon Coast. So, we bought ourselves an acre lot on Sunset Lake where we dreamed someday we would retire and go fishing on our own private lake. Next, we built the house in 2003 and kept visiting periodically until our kids got older and our lives got busier. Therefore, we decided in 2010 to open our house to other families and let them get the full experience of the gorgeous Oregon Coast. ​ Lastly, we hope you will enjoy our vacation home and come back to visit often and tell your friends and family. My wife and I visited the Oregon Coast, from Newport to Astoria, and fell in love with Gearhart and the Surf Pines gated community. We receive a lot of bookings regarding guests having allergies as they can not stay at a pet friendly home. So, if you have pets and want to bring them with you, or have friends that have pets and want to visit you, this is not the right home and we apologize in advance. If your family enjoys deep sea fishing the City of Warrenton has charter fishing boats depending on the season and can take your party out fishing. My son and I went for Sturgeon fishing and each of us got a Sturgeon about 5 feet long. There are two golf courses within a mile from the house. There is a 18 hole Golf Course at Gearhart Golf Course and 9 hole Golf at The Highlands Golf Course. We are only 4 miles away from Seaside where you can spend your time playing miniature golf, bumper cars, tilt-a-whirl, and lets not forget the outlet malls. Also, the city of Astoria is only 5 miles north of us and you must see the famous Astoria Column. You can also visit where the famous movies Kindergarten Cop and The Goonies were filmed. We call it, "The Ultimate Beach Vacation Home" and there is a reason for that! 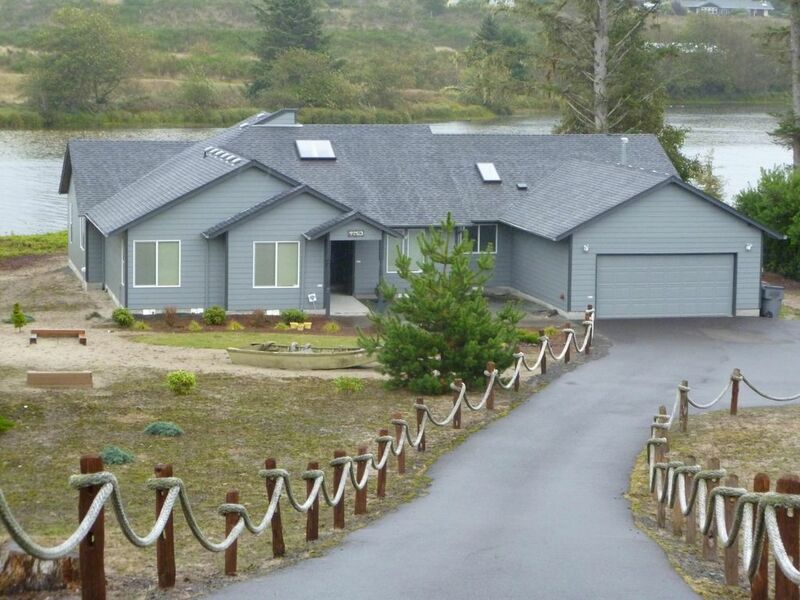 A private gated community with a one acre parcel that is right on the lake. We have a floating dock plus two 17 foot aluminum canoes, a 5 passenger paddle boat, two paddleboards, and two kayaks. A vacation can’t get any better than this and did I mention for those who want to stay at the house, there is a Swedish Sauna, a professional pool table, PlayStation III (with games), Wii console (with games), Volleyball & Bocce ball court, Foosball table, ping pong and the amenities go on and on…… There is Costco, Walmart, Starbucks, Fred Myer, Subway, and Taco Bell about a mile away, or if you're a fisherman you can catch your dinner right off the lake. toilet, shower, Private Sauna Room with a complete full Bathroom. All counter tops are Corian with molded sinks. Hand Towels, Bath Towels, Soap & Shampoo are included. 10 minute walk to the ocean with 4 different trails that will take you on the beach. If this is too long of a walk, how about driving your car on the beach and have a family beach fire. 1 Acre lot on Sunset Lake with over 150 feet access to the lake. Laundry detergent is included and is located in the laundry room. converted to game room, no room for cars inside. Bath towels & kitchen towels included. There area over 12 beach towels by the sliding door. Bowflex Home Gym available in the game room (garage). Surround sound system, leather sectional sofa, CD & DVD Player with a 55' flat screen HDTV. A new 25 ct. ft. GE refrigerator with ice water dispenser with bottom freezer. Also, for a big family reunion, we have an extra fridge in the game room. Salt,pepper, basic spices,napkins, paper towels, paper plates, outdoor picnic table. Charter Cable with over 250 channels including ESPN & movie channels. with surround sound for music and movies. books are available for kids and adults. In the garage, Ping pong table, Foosball tables. Bowflex home gym. Board games , card games & puzzles are available to use for our guests. For adults use only! High-end pool table imported from Italy. puzzles, small toys are available for kids to play with. Over 30 family DVDs to watch. Two 17 foot aluminum canoes & two Paddle Boards, with life jackets for kids and adults. One adult and one youth kayak to use on site. 2 kid bikes and 3 adult bikes. All with several helmets. 12 foot aluminum fishing boat, motor, & battery to go around the lake. Please put the charger back on the battery so the next guest can enjoy the boat. 5 passenger paddle boat to take around on Sunset lake A 7x7 floating doc to use for fishing on the lake. 3 sets of snorkelling to use on the lake. 9 or 18 hole golf course available within a mile from the property. Indoor Swedish Sauna inside with its own private shower. LIST OF ACTIVITIES ON LAND AND WATER Onsite Volleyball, Bocce Ball court, and horseshoe game. one adult size kayak, and one kid size kayak Two paddle boards Two 17' cannons 5 bikes for kids and adults to ride around the property. 12 foot aluminum fishing boat with, trolling motor, battery, and a Bench seat with 5 fishing poles. Five passenger pedal boat to ride around the lake. Great property and very attentive property manager. Highly recommend this place, as it has a bit of everything. Thank you for your recommendations and for this amazing review,Greg. We really appreciate you by taking the time out to share your experience with us. MY FAMILY AND I HAD A BLAST AT THIS HOME. THIS HOUSE HAS IT ALL, FISHING, BOATING, BIKING, POOL TABLE, PING PONG TABLE, SAUNA +++++ NEED I SAY MORE. IF YOUR LOOKING PERFECT FAMILY GETAWAY? DON'T EVEN WASTE YOUR TIME LOOKING AT OTHER HOMES. WE HAD SO MUCH FUN, FOR SURE I'M BRINGING THE FAMILY BACK THIS SUMMER. THANK YOU SO MUCH FOR AN AWESOME TIME. Thank you for sharing your experience with us and it sounds like everyone enjoyed their New Year celebration at our beach house. We look forward having you back again again. A luxurious and comfortable house that is big enough for all of your friends and family! It has everything you need for a relaxing and enjoyable experience. The waterfront view is incredible as the property is walking distance to the ocean. You ain’t find a better place to stay! The home and lake front were just as described. It was lovely! Our multi-family gathering was a very enjoyable one in this beautiful, comfortable and well equipped home. Kayaking on the lake was definitely the highlight - peaceful, exhilarating and beautiful. A few minor hiccups were swiftly and graciously addressed by Mo. He was available, attentive and kind. I highly recommend this home. The beach was a short walk away and glorious. We saw deer and elk - baby elk! The sauna was the crowning touch after playing outdoors all day. Thank you so much Suzanne for your amazing review! I work all year around to maintain and update our home so our guests can have a pleasant stay. I do appreciate you for taking time out of your busy schedule and to share your experience with us. Visited for a family reunion of 11 people. Grandparents - parents - grandkids (8-13yrs). Great experience with tons of activities to keep everyone entertained (Foosball, pool, ping-pong..etc). The boating was also excellent, this house is right on the water and the boats are right there. Turns out the "beach-front" houses on the beach side face sand dunes, so this house actually give direct water access, rather than the houses on ocean side. House was well kept up and everything worked. Overall, had an excellent stay - would highly recommend. Thank you Robert for choosing our beach home, and for taking the time to write a review! We are so glad to hear that you enjoyed your accommodations. Our place aims to provide a truly unique experience for everyone that visits, and we are thrilled that we were able to exceed your expectations. We will be honored and look forward to welcoming you back and continue your family tradition at our beach home. What a great house, great location and very relaxing time! Sunset Lake is a lake located just 5.2 miles from Seaside off Hwy 101, in the state of Oregon, near Sunset Beach. Fishermen will find a variety of fish including brown trout, bullhead, cutthroat trout, bass, and catfish here. Whether you’re fly fishing or otherwise your chances of getting a bite here are good as the lake is regularly stocked. Now what are you waiting for, get fishing! The Highlands Golf Club is a special place to play golf. Located in the historic golfing town of Gearhart, Oregon and nestled between the rugged sand dunes overlooking the Pacific, The Highlands is the only ocean view golf course on the northern Oregon Coast. It is a golf course that is fun for players of all ability levels and is a great place to play for the whole family. The Highlands is also the home of Discount Dans Golf where you will find the lowest prices on golf equipment in the United States. Great values, great prices, great service. It's just a game we love to play. The 18-hole 'Gearhart' course at the Gearhart Golf Links facility in Gearhart, Oregon features 6,089 yards of golf from the longest tees for a par of 72 . The course rating is 67.9 and it has a slope rating of 112. Designed by (R) Bill Robinson, the Gearhart golf course opened in 1892. Jason Kunde manages the course as the Golf Professional. We ask that you leave our house in the same condition as you will check in. We would like you to take a 5 minutes and walk through the house. If you notice any damages, report it "Immediately". If the cleaning crew missed cleaning an area which it's not to your satisfaction, let us know. Don't wait until your check out and we will take care of it. This is the vacation that your friends and family have been waiting for almost six months, so... enjoy your time and let us know what you need from us to make it go over the top. This is a huge house with lots of amenities to inventory and clean in 5 hours. Please read our Check-out procedures, and if you have any questions contact us the night before your check out. Please keep in mind that another family will be checking-in right after you leave. If it takes the cleaning crew extra laundry loads and cleaning, there will be an extra charge of $25.00 an hour. No pets, no smoking, no shoes inside the house.